Statistics shows that 81% of brands use affiliate marketing programs and they continue to grow in popularity, due to their performance-based nature. It’s no wonder that retailers want to add this sales channel to their reach. However, it’s not just as simple as setting up an affiliate program and sitting back and watching the sales roll in. 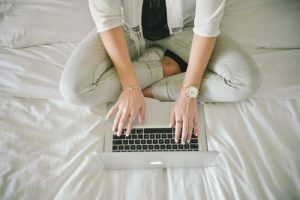 A successful affiliate marketing program requires oversight — recruiting the right affiliates for your program, ensuring all affiliates are engaged and active, policing inappropriate affiliate behavior, communicating with affiliates, and reporting, and analysis. This has been covered in more detail in the post about affiliate manager’s core responsibilities. I. You can manage it in-house with a dedicated in-house affiliate manager. II. You can have it managed by the network that you choose. III. You can have it managed it by an affiliate marketing company also known as an OPM or an outsourced program management (agency). So how do you decide which is the best option for your company? 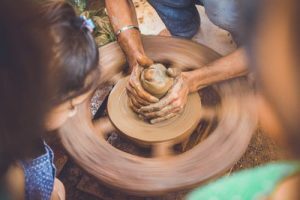 In this article, I am going to cover the latter option of using an outside company to help you manage and grow your program. There are a lot of benefits to this that you will see immediately and I have outlined each below. Right away you have access to a seasoned affiliate manager. Not only do you have access to a dedicated manager with a wealth of knowledge but you also have access to their team and their collective experience. The expertise they bring will ramp up your program at a much faster speed. Having worked with multiple clients, they know what works and doesn’t work. They have launched numerous affiliate programs and will be able to launch quickly. There are so many cost savings with using an agency. There isn’t any downtime training as they are totally versed in affiliate management. 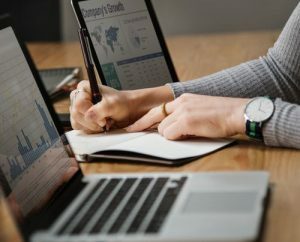 An affiliate management company will have technical resources, programs, and tools, all of which would be an additional cost should you run your program in-house. By using an agency, you get the benefits of these industry tools without the additional expense of purchasing them. This is a relationship-based business. 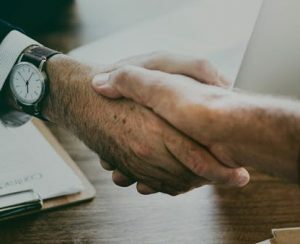 Agencies have spent a lot of time developing and growing relationships with networks and publishers and hiring an agency gets you access to those relationships immediately. 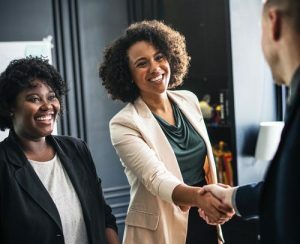 To develop these relationships can take a lot of time and work, but an affiliate management company already has the relationships in place and can hit the ground running for your program. 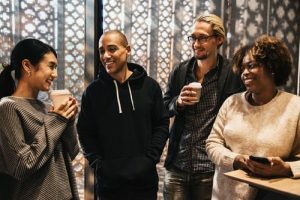 These relationships can also help with cost savings as they are better versed at negotiating paid placements, securing network discounts for you. Because it’s integral to their business, affiliate management companies will attend all the industry events. They will learn about new technologies and tools to help your program. They will know the trends in the industry and key insights. They will meet with experts in the field and learn from them and take that knowledge back to their clients. Also at these events, they will meet with qualified potential partners (affiliates, technology providers, etc). So while recruiting and finding quality affiliates is a huge part of running your affiliate program, optimization is also crucial. An affiliate management company will have experience in this area. They know the importance of quality traffic, conversion rates, and CPA. They will watch your competitors, monitor their campaigns and promotions and make recommendations. Affiliate networks and tracking software can be complex and overwhelming. 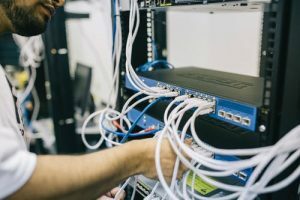 How do you decide what network to use for your program or the benefits of one over the other? Which affiliate software is best for an in-house-based affiliate program? Affiliate management agencies have set up hundreds of programs across all the network and know which ones are best for the various verticals. They also have great relationships with key people within these platforms. They can run the data and reports for you and can also leverage discounts. Affiliate management companies are often paid a retainer plus performance bonuses. These bonuses can be a large part of their compensation. They are clearly incentivized to get results so will work to ensure your program is performing. Ask questions. Find out what are their strengths and what sets them apart from other agencies. Pricing. How do they charge for their services? References. Talk with others who have used their services. Professional experience. How much experience do they really have in the realm of affiliate program management? Possible conflicts. Do they manage competitors’ or potentially conflicting programs? Representation. Do they attend industry events? How else will they be able to give your program maximum exposure? Niche experience. Do they have experience in your niche or vertical? Using an agency to manage your program gives you access to a wealth of knowledge and resources that can take your program to the next level. Set clearly defined guidelines and work together to grow the program. Outsourcing does not mean giving up control of your affiliate program. Rather, you are enhancing the program with the use of the best and brightest in the industry. We hope that we have given you some insight into the benefits of using an affiliate management company. Good luck with your program and feel free to email us or comment below with any ideas or questions. I am obsessed with home improvement shows. I watch them all — Fixer Upper, Property Brothers, Flip or Flop — and have recently started binge watching Tidying Up with Marie Kondo. I realize I am not alone as there are lots of blogs on the rise regarding home projects, DIY and easy ways to update your home to the recent trends. There are several sites that I follow that provide great tips on how to carry out some home projects and where to buy the necessary material. For these sites, valuable and engaging content is what attracts their readers and keeps bringing them back. We’ve all heard that “content is king” and its true. Content is the core of online marketing and how we talk to an audience and attract traffic to a site. It’s necessary if you want to grow a successful business and is what turns prospective customers into buyers. Customers search the Internet for reviews and information about products to help them make informed buying decisions. As a home improvement blogger, I know that strong content is crucial and that is where I need to focus my time. However, I also want to monetize my site and there are several content monetization platforms that can help. These platforms are, essentially, tools that allow you to benefit from affiliate marketing without having to join individual affiliate programs. Once you’ve integrated with them, they would transform regular links into affiliate links. If sales are generated from these links, commissions will be passed back to the website after taking a percentage. For example, if I write about the latest and greatest Dyson to help upkeep my home, these content monetization tools will change my retail link to an affiliate link so that I can earn money from sales that I refer. So before I give examples of some of the available monetization platforms, let’s talk about the benefits of using them. By using these tools you have access to lots of merchants and you don’t have to individually apply for each of their programs. Plus you don’t have to individually create affiliate links. Seamless. You can basically set it up and go about what you do best writing content! You post a retailer link and they convert to affiliate links. Click-through rates are better and the links are kept up to date. Because they do such a large volume of business, these tools can often negotiate a higher overall commission rate with the advertiser. So even with paying them a percentage, you may still be better off than you would be able to get on your own. If you have a lot of traffic and product-related content, these tools can help you earn money. Their reporting interfaces contain great data on your customers and their purchasing habits. Whatever you earn is incremental. If you already have some affiliate links on your site, the tools will not overwrite those. If you choose to monetize the content you produce, remember of the necessity to stay compliant with the Federal Trade Commission’s disclosure requirements. Now let’s take a deeper dive into some of these content monetization platforms. In what follows, I’ll review several of them for you. VigLink Convert. This takes your unaffiliated merchant links and automatically converts them to monetized links. Add links to products and this will link to a merchant. VigLink Insert. 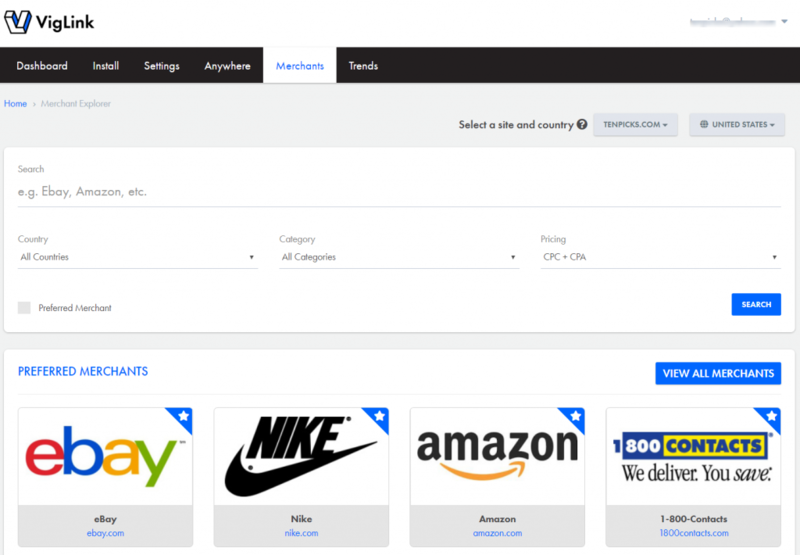 Insert scans your site for common product terms or merchant mentions and adds an affiliate link. VigLink Anywhere. With VigLink Anywhere, you can turn any social media link, email link or any other link into a robust, high-powered hyperlink that earns you revenue. This means you can now make money from Twitter, Instagram, Facebook, Pinterest, and your email list. The opportunities are endless! Another great feature of VigLink is their dashboard which tracks analytics for your site. You can see what content is popular and what people purchase. Like VigLink, Skimlinks is also super-easy to install. You add a snippet of code onto your site and all links to merchants in the Skimlinks network become affiliate links. Skimlinks keeps 25% of the commission and 75% goes back to the website owner. Desktop widgets to research revenue-generating products to write about. 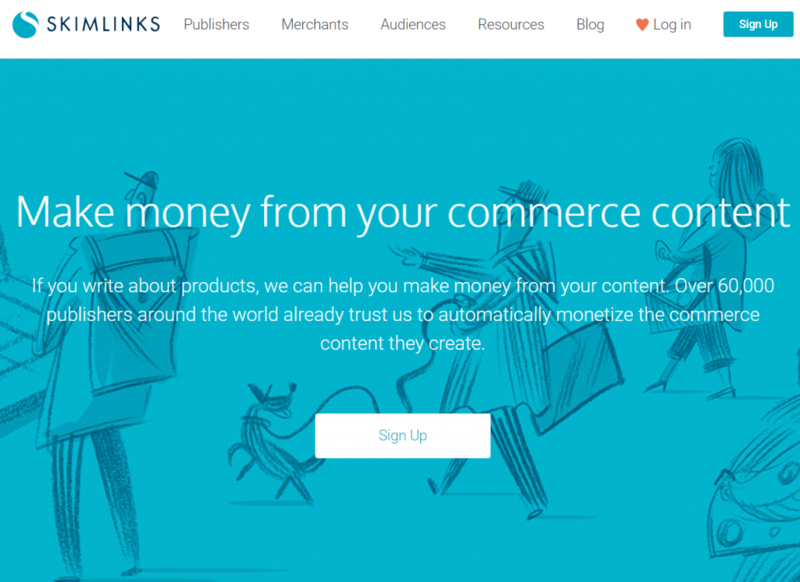 Audience By Skimlinks allows publishers to can gain access to a deeper, broader dataset for better insights on their audience and shopping behaviors. Aggregated product feeds to create your own shop front. URL shorteners so that you can also monetize your social accounts and email. If a merchant offers a Skimlinks commission rate. What the average commission rate from the last 30 days was. If exclusive commission rates are available. Find out more details on commission rates and merchants at the click of a button. Quickly create links for social media and email. Discover new merchants that offer commission rates. 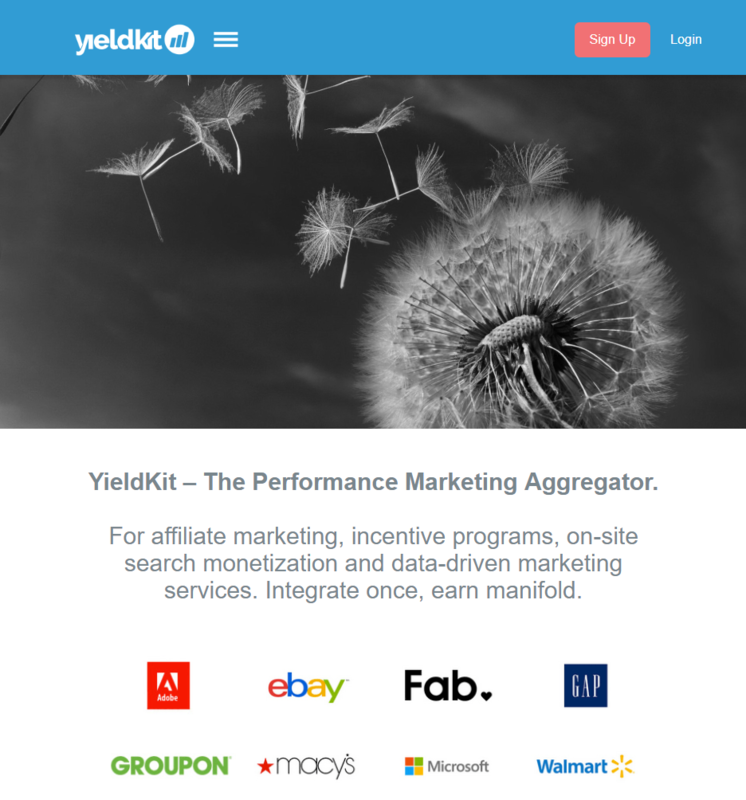 YieldKit enables publishers to aggregate and optimize their performance marketing via their Yieldkit’s Monetization Platform. Like the others, they automatically convert links, keywords and onsite searches like brand and product mentions into monetizable links from thousands of retailers. YieldWidget – a widget is injected over your links. Its small in size and boosts the user’s experience as it is filled with relevant content and detailed information that will greatly increase conversions. It offers an image of the product, a brief description, top 3 places to buy and reviews of the linked product. Offering a few places to buy helps increase the chances of conversion. YieldNative – a functionality that allows publishers to generate and embed ads exactly the way they and their users like best. Inserting Native ads in content wherever they provide value. YieldSearch – a technology that detects keywords in user’s search queries in the publisher’s website search box and shows relevant ads embedded on the results page. Yield Insights allows you to discover what topics are most relevant to users and what topics deliver the highest revenue. Insights can be used to learn more about your audience. 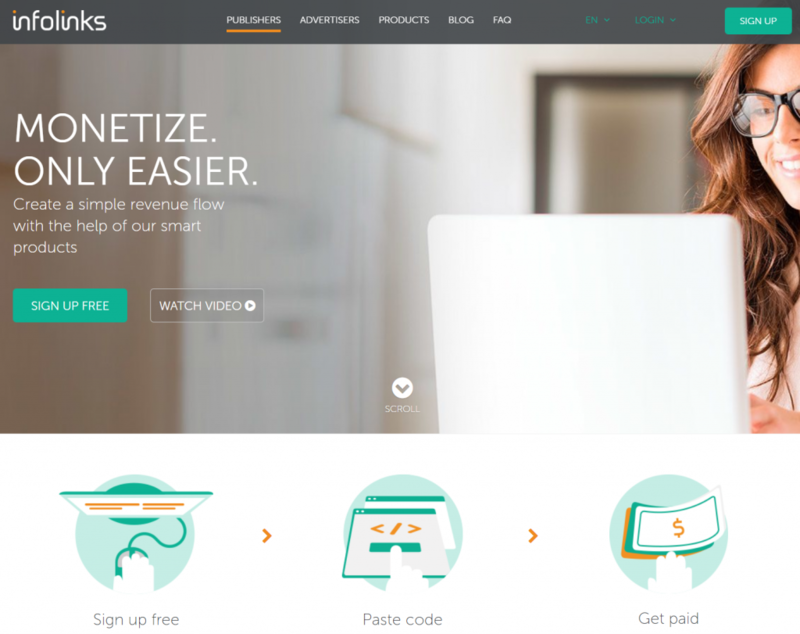 Infolinks is an online advertising platform that enables website owners to make money from their site by displaying relevant ads to their visitors. You can select from a number of ad units that best suit your needs. It’s also super easy to sign up and install: Just enter your website address, add a snippet of code to your site, and get paid. Each advertiser on Infolinks sets their own price and as a publisher, you receive 65% rev share. InArticle: Highly viewable ad which opens once a user engages with the page content. InFold: This ad unit takes advantage of the power of search and display, delivering ads on a wider scale of traffic. These will appear in right above the fold. InScreen: An interstitial ad delivering relevant content between page views. InText: Ads are neatly presented within a page’s text. You can customize the link color, and choose how many will appear on a page. InTag: This shows the most valuable keywords related to the content of the page. Hover over these words to view the ads. InFrame: These attractive display banner ads appear alongside your content. 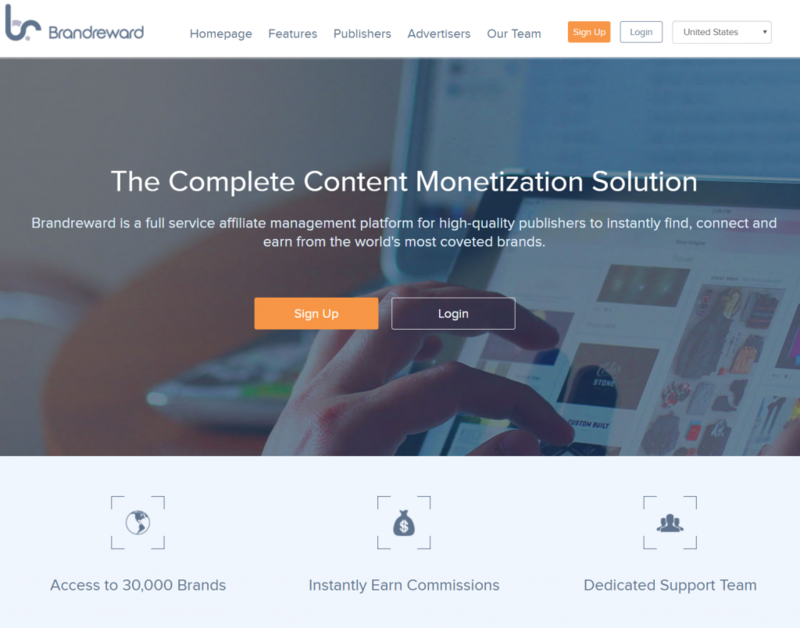 Brandreward was created to help content networks, apps and websites realize the “real value” of their content by easily and effortlessly monetizing through a complete platform solution. It is a full-service platform which allows publishers to instantly find and connect with top brands. Their site states that they work with 30,000 brands across the world. Some of the brands listed are Nordstrom’s, Kate Spade, Target and PetSmart. 85% commission policy for publishers which is higher than the industry standard of 75%. Brandreward has a real-time advertiser system, ensuring publishers have the highest possible commission at the time of each sale and that links are live and commissionable across servers in 3 different countries. Referral program. For every successful referral that you send to Brandreward, you will receive 35% of the earnings for the next two years. 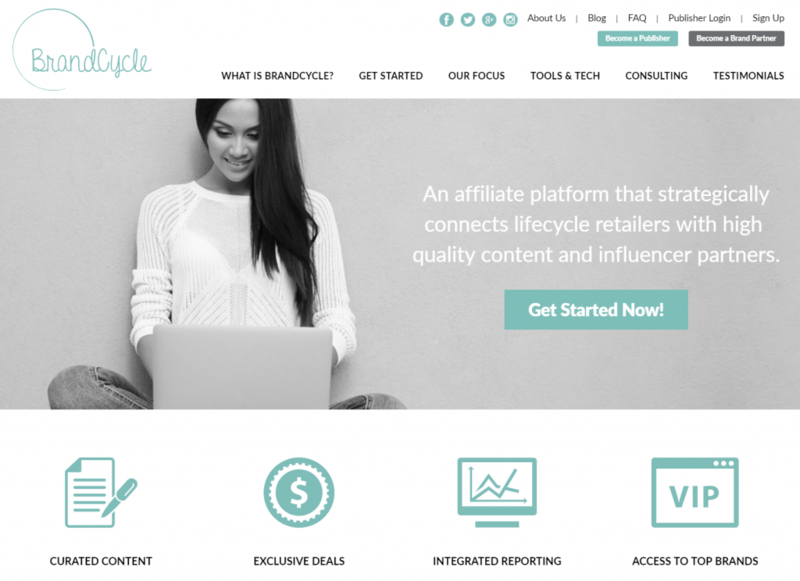 BrandCycle is an affiliate monetization platform that connects retail brands with lifestyle publishers. BrandCycle works exclusively with lifecycle publishers – meaning content driven websites that cater to the following niche audiences: Mom & Family, Wedding, Style, Home Decor, Health & Wellness, Baby Boomer and Green. It is free for publishers to join. BrandCycle also has a consulting team to work with large-scale publishers who are looking to enter or grow their presence in the affiliate performance marketing space. They will provide strategic recommendations and dedicated publisher development services to help you get the best deals and maximize relationships with advertisers. Publishers/Influencers: Get immediate access to over 300 top retailers on a performance basis through a single payment and reporting interface. We also help negotiate rates and design custom content and campaigns around new products and deals to use on your site or across social media. Leverage exclusive campaigns, value-added content and special promotions to increase affiliate partnerships and drive incremental sales. Advertisers/Retailers: You want the long tail, but you need to improve efficiencies around long-tail recruitment and activation. BrandCycle provides instant and fully transparent access to thousands of high- quality content publishers and social influencers in the mom, family, baby, wedding, home and lifestyle spaces. BrandCycle works through multiple affiliate networks, including ShareASale, CJ, Impact Radius, Rakuten Affiliate Network, and Pepperjam with additional integrations underway. BrandCycle’s technology delivery content and campaigns to publishers and affiliates in a more streamlined, user-friendly way. 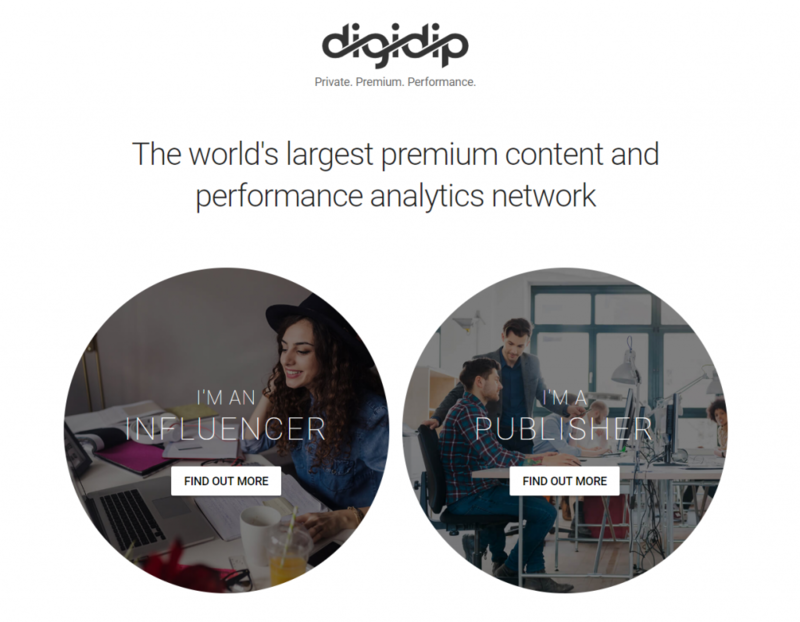 digidip is another example of a tool that provides an easy solution to monetizing your website. The company started in Germany in 2013 by Sabrina Spielberger, who was a successful blogger. Today they operate in over 50 markets worldwide and provide access to multiple networks and to more than 40,000 advertisers. Some of the advertisers listed are Groupon, Debenhams, Macy’s, Target and Walmart. They have a lot of the same features as others. They are free to use, saves you time, and easily turns retail links into affiliate links. The difference is that they work on invite only and focus heavily on being ‘premium’. They want to ensure that their publisher network has a high quality and thus creates, not only for the network but also for the associated advertisers, networks and agencies, an additional value. So they have a certain set of guidelines and standards that you need to meet to join. As you can see, there is a variety of content monetization platforms to help you earn money from your website. The key is to make sure that your content is authentic so that your readers continue to return and your audience grows. That’s one of the things makes you a truly valuable partner to any online advertiser. You should partner with brands that are relevant to your audience and deliver value. I hope that you find this information useful and please contact us or comment below with any questions or feedback. Disclosure: If you click some of the above links and sign up, we may be compensated for this. Regardless, we only recommend products/services we use personally or believe to be of value.